This delightful private villa is set behind secure lockable front gates including a pedestrian gate with intercom access in beautifully landscaped gardens with its own immaculately maintained private pool. 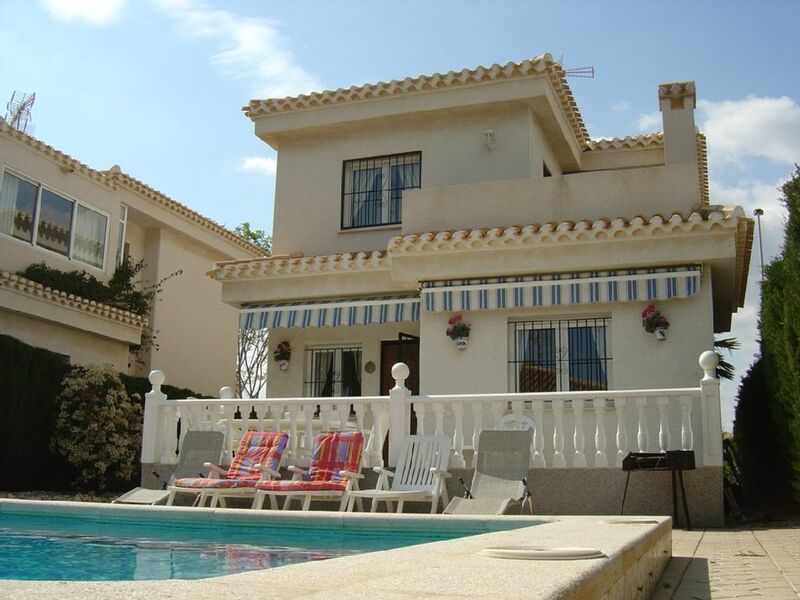 The villa has recently been repainted both inside and out, a new barbeque built and a new kitchen and appliances fitted.The upstairs consists of two double bedrooms and family bathroom with full shower. Each bedroom has its own sun terrace, one of which has views of the nearby mediterranean.The ground floor has an open plan lounge and dining area, separate fully equipped kitchen, utility room with washing machine, twin bedroom and shower room. The lounge leads onto a further sun terrace which can be fully covered with a sun canopy and has a table and six chairs.The large private pool has a shower and is surrounded by extensive terracing with six sun loungers and a barbeque. Notes: Villa is fully air-conditioned hot and cold. Beach towels not supplied. No smoking.Playa Flamenca is approx 35mins from Alicante and 20 mins from Murcia airports. This is an ideal base for families and golfers alike. Torrevieja is 10 mins away by car and is a delightful Spanish town boasting a marina, waterfront market, street artists and entertainers, shops, numerous cafes, bistros, bars and restaurants and a beautiful church square. The superb palm-lined promenade and harbour board-walk are the ideal places to go for an evening stroll. other attractions include go-karting and aqua park. The area of Playa Flamenca makes a perfect base for the discerning holiday maker to explore the surrounding area including visiting the historic towns of Orihuela and Cartagena, a drive through the mountains to the west, a round of golf at one of the 3 nearby championship golf courses or just lazing on one of the nearby blue flag beaches. For a fun day out Benidorm and the theme park of Terra Mitica are 1 1/2 hours away. The fabulous new La Zenia Boulevard is only a short walk away open every day of the year featuring free parking, an array of restaurants, shops and leisure outlets, a hypermarket, Zenia Kids where the children have their own games and workshops with instructors, a healthy park with ping pong tables and outdoor gym machines, TV with all your favourite sports, cinema, entertainment including concerts, performances..rhythm entertainment and fun for everybody. Normal availability: Saturday 3pm to Saturday 10am. Transport to and from Alicante and Murcia(San Javier) airports at a very reasonable rate can be arranged as well as car hire at very competetive rates.For cheapest airfares Easyjet, Mytravelite, BMIBaby Jet2 to Alicante, Ryanair and Jet2 to Murcia. Both bathrooms have a separate shower, vanity unit with lights. Internet is availble for those who wish to access it at a small extra cost. Please contact the owner. Bath towel and hand towel provided for each guest. Beach towels not provided. Kitchen is fully equipped. There is also a utility room with washing machine and fridge freezer. Playa Flamenca is situated just off the N332 and the motorway A37 linking Alicante, Cartagena and all other major cities north and south. It is close to 4 Blue Flag beaches, just a short drive to 3 spectacular golf courses and 15 mins to the Mar Menor(inland sea), which is approx 10 degrees warmer than the Mediterranean and has the famous theraputic mud baths. The local blue flag beach is a short walk away and caters for all sporting activities, with a beach bar for those who like to relax with a long cool drink and people watch. The villa is within a short walking distance of the prestigious new commercial centre La Zenia Boulevard with a huge variety of high profile shops, bars and restaurants catering for every taste. Other Activities: Boat trips and sailing school, aqua parks, go-karting.A must is a visit to the beautiful Isle of Tabarca. Boat trips go from Torrevieja every day.